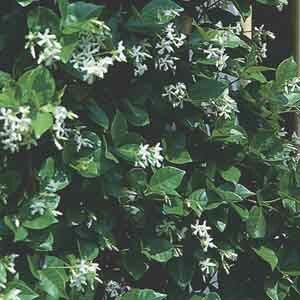 A woody climber with lush, glossy green foliage that shades to hues of bronze red in winter. Star Jasmine's exotically scented, white blooms perfume the summer garden with their intoxicating fragrance. Commonly used to climb fences or walls. Beautiful trained to posts, latticework and trellises. A reliable groundcover for any location. Once every month during growing season. A heat tolerant selection. Plant in fertile, well-drained soil. Keep soil moist, watering freely in dry weather. Provide climbing support, tying shoots up until well established.